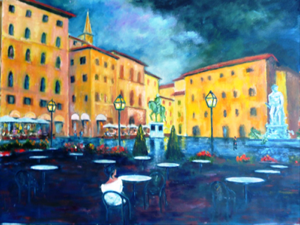 art galleries exhibiting paintings and sculptures by the great masters as well as more contemporary works, theatre, opera and concerts providing sublime entertainment, the list is endless. But this feast for the senses would not be complete without the gastronomic delights to be found in the countless bars, gelatorias and restaurants, many in the centro storico and easy to find on foot now that the area has been pedestrianised. What I love about Tuscan cuisine is its simplicity; just a handful of wonderfully fresh and locally grown products creatively combined to produce a delicious dish, usually with bread including focaccia, olive oil and cheese on the side. Prices and quality vary; there are the more formal and more expensive restaurants for the gourmet and for that special occasion, some with Michelin stars. At the other end of the scale there are those to be avoided; the over-priced restaurants filled with tourists, probably because they generally look out enticingly onto the main piazzas. The menu provides a good choice of the usual favourites and being hungry I decided to order a Bistecca alla fiorentina, a dish that is famous in this part of the world. I was not disappointed; the steak, which was served with a simple side-salad was tender and succulently delicious, made more so by the accompanying glass of a smooth, velvety Chianti Classico – wonderful. Like many good things in Florence, the history of this classic dish can be traced back to the days of the Medici family and to the English traveller. The legendary San Lorenzo has long been revered in Florence both for his goodness and his martyrdom – folklore has it that he was roasted alive over burning charcoal. The Medicis began the tradition of holding the festa of San Lorenzo each year on 10 August, a day when it’s also possible to see the meteor showers from the Perseus constellation, described by the locals as the tears of Lorenzo. Meat was roasted on huge bonfires and distributed to the ordinary people in honour of the saint and visiting English merchants are said to have called it beefsteak, which eventually translated into the Italian word, bistecca. 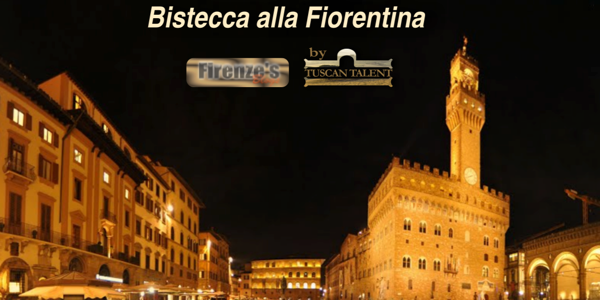 There are also other accounts of the wealthy English settlers and visitors who flocked to Florence in the 19th century and introduced new cuts of beef, including T-bone and porter house steaks, giving birth to the bistecca alla Fiorentina, now a Florentine classic. 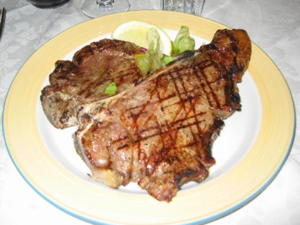 The source of this steak is usually the local fine Chianina bread of cattle. It is traditionally grilled using wood, charcoal or chestnut embers, seasoned with salt and pepper, drizzled with olive oil once it is cooked and garnished with a lemon wedge and lightly tossed green salad. 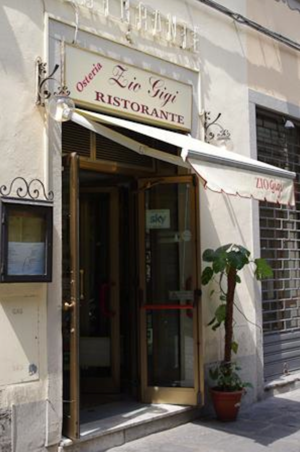 I left Gigi’s, pleasantly full, having enjoyed not only the food and wine which were by the way excellent value for money, but also the warm, vibrant atmosphere, excellent friendly service and of course, the songs! The restaurant is only a stone’s throw from the Duomo and on my way back a jazz combo was entertaining the crowds. 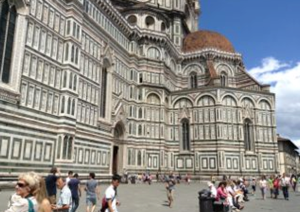 Another Florentine delight!